Aizawl, July 28 (IANS) While the paramilitary Assam Rifles has stepped up security on the India-Myanmar border along eastern Mizoram to stop drugs and arms smuggling, border fencing work is on in western Mizoram along the India-Bangladesh frontiers, an official said here on Friday. “Of Mizoram’s 318-km border with Bangladesh, 233 km is to be fenced by March 2019,” an official of Mizoram’s home department said. The official said the fencing work along the India-Bangladesh border with Mizoram has been delayed due to several reasons, including topographical adversaries. Two central government agencies — Engineering Projects India Limited and National Projects Construction Corporation Limited — are erecting the border fencing in Mizoram. The Assam Rifles, anti-insurgency trained paramilitary force, has stepped up security on the India-Myanmar border along eastern Mizoram to stop drugs, arms smuggling and cross-border movement of inimical elements. An Assam Rifles official said the higher authority of the central paramilitary force has alerted troops deployed along the 510 km-long India-Myanmar border with Mizoram to tighten vigil along the porous border. 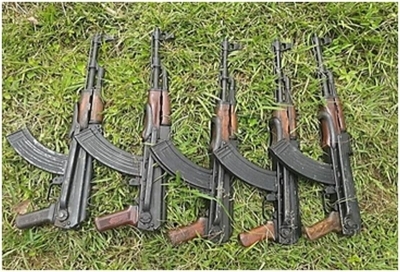 Acting on a tip-off, the Assam Rifles troopers recently seized five AK-56 rifles, some loaded magazines and ammunition between Farkawn and Vaphai villages in Mizoram adjoining Myanmar. These weapons were likely meant to be sold to Manipur-based insurgent groups. Until 1986, after two decades of terrorism, Mizoram become a peaceful state but the arms and drugs smuggling from Myanmar has become rampant in recent years. To review security along the India-Myanmar border, Union Home Minister Rajnath Singh accompanied by his deputy Kiren Rijiju last month held a meeting in Aizawl with the Chief Ministers and senior officers of four northeastern states, which share borders with Myanmar. Arunachal Pradesh (520 km), Manipur (398 km), Nagaland (215 km) and Mizoram (510 km) share the 1,643-km mountainous border. There is a 16-km-wide free zone (eight km on either side) along the unfenced border. Nagaland is unwilling to erect fencing along the India-Myanmar border, citing spoiling of relations among the ethnic tribals living on both sides of the boundary.